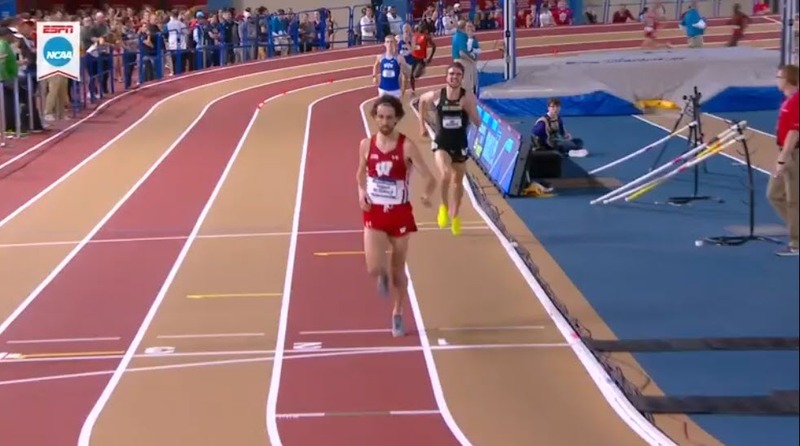 BIRMINGHAM, Ala. —A pair of Wisconsin runners won the 5000s tonight at the 2019 NCAA Indoor Track and Field Championships as senior Morgan McDonald lived up to his favored status and won the men’s 5000 in 13:41.76 and junior Alicia Monson, the third-fastest collegian ever at 3000, took down four of the 10 fastest women in NCAA history in the women’s race by running 15:31.26. 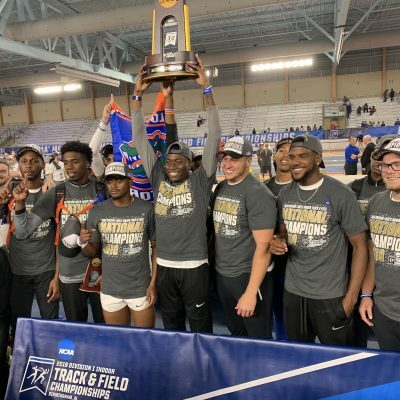 It was the first NCAA track title for both Monson and McDonald (McDonald won the NCAA cross country title in the fall as well). After a 5:07 first 1600, the pace got a little quicker during the second mile as two-time NCAA steeplechase champ Allie Ostrander did most of the leading, taking the field through 3200 in 10:09. However, the real racing didn’t begin until Weini Kelati of New Mexico, the 2018 NCAA XC runner-up, made her bid for glory with 1600 to go. Only 2 of Kelati’s first 17 laps were under 37 but she’d run sub-37 all the way home. Her surge in pace turned the race into a two-person battle between her and Monson with 1k to go. Monson ran right on Kelati’s shoulder and at times looked impatient. On the final lap, we found out why as Monson took the lead as she rounded the first turn and never looked back. 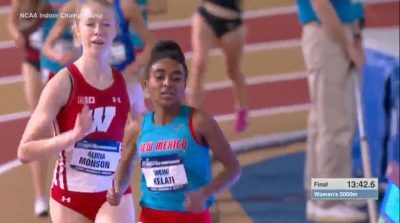 Monson had another gear and closed off her 4:44.21 final 1600 with a 33.65 final 200 (Kelati only could manage a 35.40 — her fifth straight 35). Behind them, Stanford sophomore Fiona O’Keeffe, the four-time first-team All-American (three in XC, one in outdoor track), had the second-fastest last lap of the night, 34.58, to grab third in 15:37.61 as 2017 NCAA cross country champion Ednah Kurgat was 4th in 15:39.04, the same time credited to her teammate Charlotte Prouse as the New Mexico Lobos scored 17 points in the event. 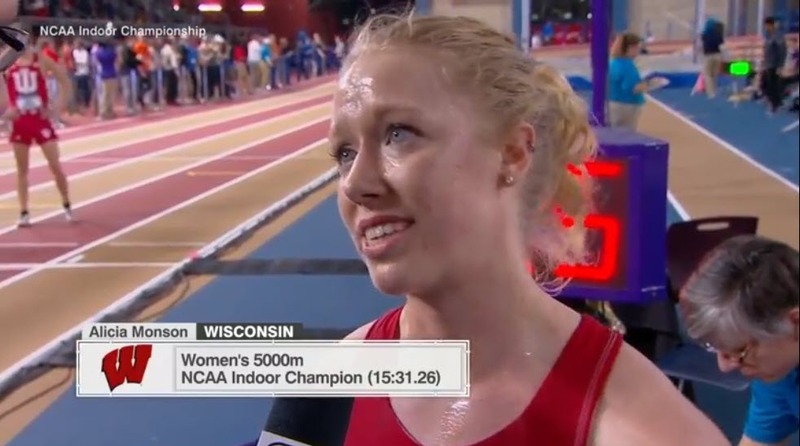 Monson’s victory today was the first NCAA indoor track title for a Wisconsin Badger since Amy Wickus won the last of her three straight titles in the 800 in 1995. Coming into the men’s 5000, it sure looked on paper that McDonald, who has a lifetime best of 13:15 in the 5000 whereas no one else in the field had ever broken 13:30, was way better than everyone else and when the race was over that had been confirmed. BYU’s Clayton Young, who was only 72nd in cross country last fall and had never scored before on the track, did most of the leading through the first half of the race (1st 1600 was 4:27.57) before Campbell’s Amon Kemboi, the #2 seed with a 13:33 sb, took over (3200 in 8:59.31) and led until less than 2 laps remained. McDonald was right on his shoulder virtually throughout and coming off the 4th to last turn with just over 350 meters remaining, McDonald finally had had enough and shot to the lead. The only people that could even stay relatively close to McDonald were Colorado’s Joe Klecker (13:35 pb, 8th at 2018 NCAA XC) and Young, but by the time McDonald got to the bell, it was clear the last lap was going to be his coronation. Despite looking over his shoulder several times in the homestretch and letting up before the line, McDonald ran his final 200 in 26.58 to win by a more than a second in 13:41.76 as Klecker took second in 13:42.79 with Young third in 13:45.34. 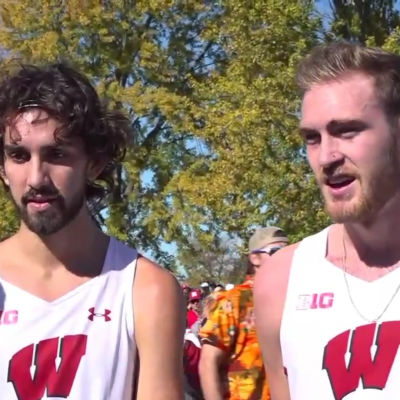 McDonald is Wisconsin’s first NCAA men’s champion in an indoor track (not field) event since Chris Solinsky won the 5000 in 2007. McDonald was clearly the best man in the 5000 tonight and while Stanford’s Grant Fisher didn’t anchor Stanford to victory in the DMR, he was pretty spectacular as he split 3:54. 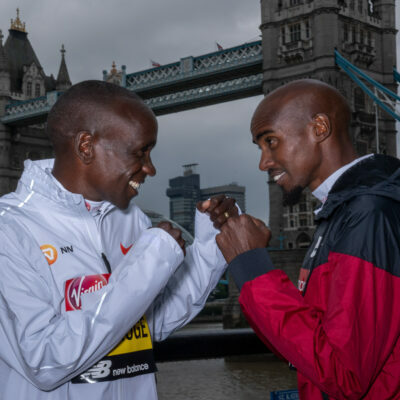 We can’t wait to find out who is the best in the 3000 tomorrow. 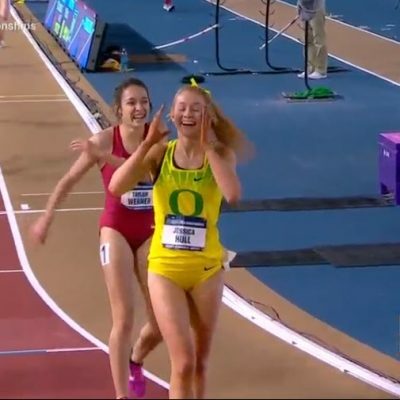 To be honest, as dominant as Monson was tonight, it’s hard for us to imagine her losing the 3000 tomorrow but then we remind ourselves that Oregon’s Jessica Hull won the 1500 outdoors last year and anchored Oregon to DMR glory tonight. One year ago, Monson finished 13th in this race, 32 seconds behind Kurgat and 27 seconds behind Lokedi, both of whom won NCAA titles in 2017-18. 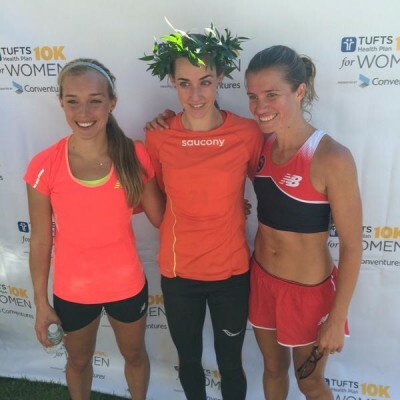 Outdoors, Monson was 16th, 23 seconds behind winner Karissa Schweizer. She was one of the better runners in the country, but there wasn’t much to indicate that she would become the best within a year. Then came the cross country season, and when Monson surprisingly won the Nuttycombe Invitational in September, everyone in the country knew she had reached a different level. But Monson knew she was ready make the jump after finally logging a good summer of training. Now she knows how hard she can push her body without surpassing her limits, which has allowed her to continue building fitness, season on top of season. Tactically, Monson was right on the money tonight — she knew she had the best kick in the field, and she used it — but tomorrow’s 3k will be a bigger challenge. Monson said she’s well aware of Hull’s speed at the end of the race, but added that “weird things happen” and isn’t counting herself out. McDonald’s plan was simple tonight, but when you’re the best guy in the field, sometimes a simple plan is all you need. Similar to NCAA XC, he said that his strategy was to get in good position, respond to any moves that were made, and when he felt the time was right, make his winning move. That’s exactly how it played out, and though he moved later than he did in XC — where he waited until midway down the final straight — the outcome was the same. The big difference between this win and cross, McDonald said, was that he has another NCAA final to run tomorrow. McDonald’s win also continued the streak we pointed out in our preview: the last six times the NCAA XC men’s champ has run the 5k at NCAA indoors, he’s won that race as well. Kelati ran a fine race tonight and did what she had to do to give herself a chance to win, driving the pace hard from a mile out. Perhaps she could have taken off even earlier, but leading that much is tough, and there’s no guarantee it would have worked against the sensational Monson. 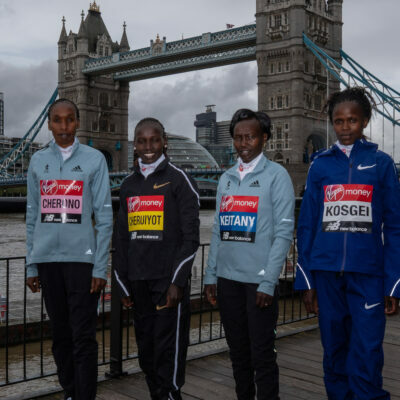 Realistically, Kelati did all she could do; she was simply beaten by a superior runner. 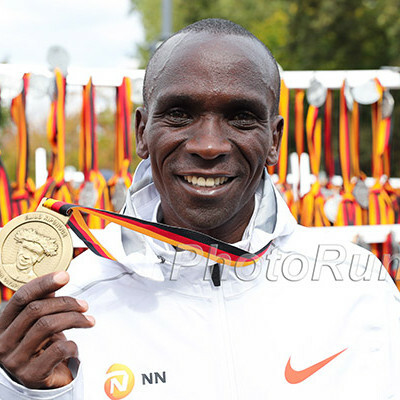 Kelati was pleased with her performance after the race, noting that she was 5th last year. She wanted to be first tonight, but at least she is moving in the right direction. Kelati was a little lucky to be in the race considering she false-started, but she was only given a warning and allowed to run. MB: Grant MF Fisher splits 3:54.24 and loses!! !